Graycie, Clyde, Yoda, and Bruce were rescued after being brought to an animal control facility at just 4 weeks of age. They were an emergency rescue because they were not yet eating well on their own. They have already all found loving, wonderful homes and were adopted in pairs just days apart the end of November. Graycie and Clyde (now Daphne and Joe) were adopted first when Clyde expertly ingratiated himself during the adoption visit by curling up in a lap with Graycie. Their family had planned to just take Graycie home to be a companion for their current kitties but Clyde showed them how well he would fit in too. We've received a couple updates for Daphne and Joe and some photos from the adoption visit showing just how irresistible these kittens are. Here are some pictures of “Graycie & Clyde”. They are settling in nicely, and are very anxious to meet the rest of the family. We’ll wait a few more days for that. Robert and friends have done a wonderful job socializing them. They want to make friends with everyone. We loved their birth names, but we decided to rename them. I named Daphne and my husband named Joe, but I call him Little Joe. When Joe gets older, we’ll call him Big Joe. He’ll fit right in with Buster and Sonny. Daphne and Little Joe cozied up to Buster yesterday. All is quite friendly. Daphne & Joe are very loving toward us, which is purrrfect! A few days later Yoda and Bruce (BruceLee) entranced their new family and they found a home together too. And we've received a couple updates for this cute pair too. I know it has been only about 14 hours but I had to write to tell you how fantastic the kittens are!!! Yoda is the feisty one of the two and BruceLee hangs back a tiny bit more than his brother. After they just calmly walking into the cat carrier to go to their new home, they were totally quiet until about 5 minutes from home and then I could hear a little whining noise. Turns out Yoda was chewing on BruceLee's neck and he came out of the carrier with very wet fur!! No worse for the wear though! They are presently residing in the guest room and I spent part of the night with them (more for me than them) they entertain themselves wonderfully. I put a large low square basket on the bed with fleece in it and they immediately climbed in it and curled up for a nap. Yoda is fascinated with the 'cat' in the mirror and they are both so playful and sweet, We are just thrilled to have them. Our cat Buddy is a little timid about them but I am sure they will win him over. Thank you for all of your help. And thank Rob and Alli for doing such a great job of socializing these kittens. 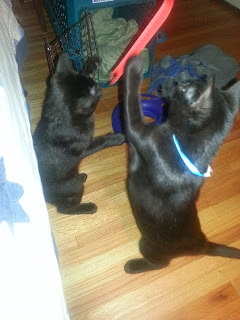 Hope you had a good Thanksgiving... We are having a Black Cat Friday as the 'boys' are zipping around and playing! Hard for me to take pictures of them as they zip around. They are very good and respectful of the elder cat who is warming up to them. They love all the toys we have and they are doing very well. I was amazed at how they just have gone from room to room and even down the basement so bravely. They are very well adjusted and interested in every thing. 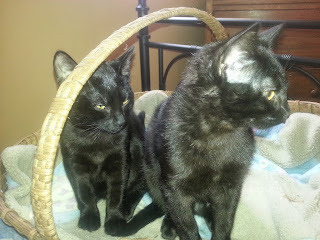 At night we close them into "their" bedroom and they happily curl up together in their basket and are good all night. What a delight they are, we love them. Thanks again for all your help and thanks to Robert and Alli for raising up such great kittens! Thank you to their families (and all the families that adopt from us) for opening up their homes to these Feline Rescue kittens!